Why would young Australians buck international trends and move to the country? According to our research, a growing youth population has been observed in coal seam gas (CSG) development areas within the Surat and Bowen Basin regions of Queensland in recent years. In contrast to other rural areas of Queensland, where the youth population is not growing, those two regions taking in areas such as Chinchilla and Moranbah have seen their youth population grow. For example, in Chinchilla there were 1,112 young people aged 15 to 29 years old in 2006; just five years later, the number of young people had increased by about 46% to 1618. Out of that total, the male youth population in Chinchilla jumped 53% (to 978 young men), while the female youth population rose by 36% (to 640 young women). This noteworthy increase in rural youth – for both men and women – is also seen in the broader regions of the Surat and Bowen basins, where CSG development is happening. Figure 1. 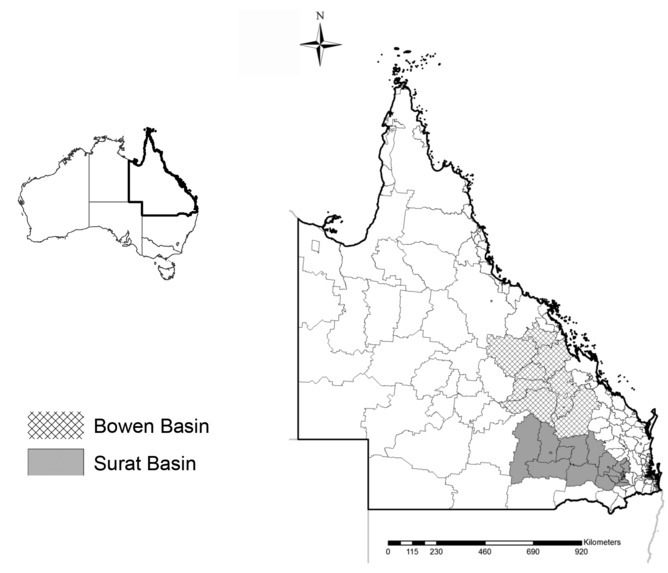 Regions in Bowen and Surat basins, Queensland. Over the same period, family incomes have grown and overall employment has increased. However, in studying the impacts of unconventional gas development, the one negative trend we found was that agricultural employment had decreased more than the rest of rural Queensland during the expansion of the coal seam gas industry. Declining populations in rural regions is a worldwide phenomenon. That’s because young people are usually the first to leave, seeking employment, training and education opportunities in cities. After gaining new skills and experience, 20-somethings tend to stay in urban areas rather than return to their rural homelands. And women are more likely to leave rural areas than men. The combined impact of these trends is a reduction in the skills base of rural areas and a skewed population, with more older people and far more men. In figures 2 and 3, we track the age group which was 15-19 in 2001 though time up until 2011. In the control group, which is made up of other comparable rural Queensland regions (dark grey line), the youth population is at its lowest when this group hits their early 20s. By contrast, for communities in coal seam gas areas (blue line) the youth population is increasing throughout their 20s as more people stay in the region and others come to the region as CSG development takes off. 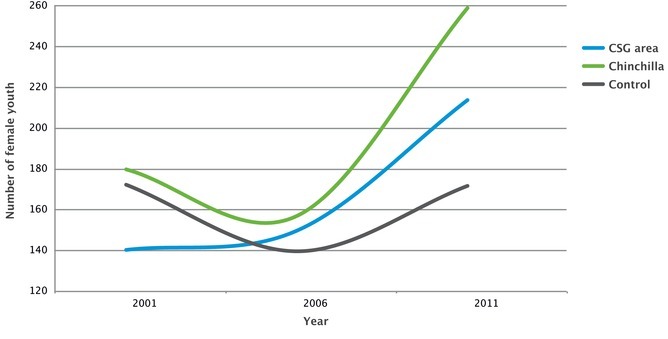 Figure 2: Changes in female youth over time (ABS 2013). The blue line is the average for towns and communities where CSG development occurs. The dark grey line is the average for regions without CSG development (control). The green line represents Chinchilla. 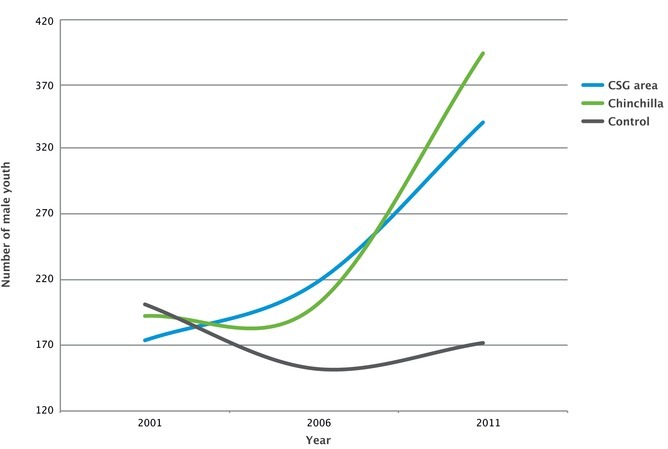 Figure 3: Changes in male youth over time (ABS 2013). The blue line is the average for towns and communities where CSG development occurs. The dark grey line is the average for regions without CSG development (control). The green line represents Chinchilla. We’ve singled out the case of Chinchilla (green line) as an example of a turn-around in about 2006 from losing young people to gaining young people as the pace of CSG development speeds up. Because these increases occurred in male and female populations, the research suggests that the wider rural population are experiencing social and economic benefits from the CSG sector, rather than just a male workforce commuting from distant cities, as can happen with fly-in fly-out workforces in other contexts. The fact that rural youth populations have grown in regions with CSG development is a significant finding and an important contributor to the health of rural communities. In terms of the long-term future of rural communities,re-injection of youth may indeed be more important than the focus on jobs, which has traditionally been the main way that the industry has sought to demonstrate its benefit to rural communities. Our research also found that jobs have increased in regions where CSG development has occurred. During the ten years between 2001 and 2011, jobs in the resources sector across rural Queensland increased; notably this increase was about 31% more in CSG regions than in other rural Queensland regions. This figure is even higher when looking only at the Surat region, where it has grown by 45%. For every new job in the resources sector there has been around two new jobs created in the related sectors of construction and professional services. By contrast, for each new job in the resources sector there has been a reduction of 1.7 jobs in agriculture. These new jobs in CSG areas are not just restricted to males. Focusing on Chinchilla, total female employment increased 26% from 1204 in 2006 to 1516 in 2011. Over those five years, women left some agriculture and manufacturing jobs, but increased their employment in mining, construction and hospitality. Another important finding is that family income has increased more in regions where CSG development has occurred. Family income increased by around 15% in the average region with CSG development when compared to other rural regions in Queensland. Family income is a useful measure of benefit because it provides an indicator of income that stays in the region, compared with other measures that may be affected by long-distance commuting workforces, who spend their income elsewhere. However, while family income is up, this also has to be balanced against higher housing costs in some CSG regions such as Chinchilla. We found that CSG regions had slightly more educated populations, but mostly among men. Poverty reduction was also observed in CSG regions, concentrated particularly in Chinchilla. Finally, it is also important to consider the impacts of CSG development on other aspects of community well-being, such as noise and stress. These issues are currently being explored in related projects conducted by CSIRO. Tom Measham receives funding from the Gas Industry Social and Environmental Research Alliance (GISERA), which is a collaborative which is a collaborative vehicle co-founded by CSIRO and Australia Pacific LNG Pty Ltd to undertake research that addresses the social and environmental impacts of Australia’s natural gas industry. The partners in GISERA have invested more than $14 million over five years to research the environmental, social and economic impacts of the natural gas industry. GISERA projects are overseen by an independent Research Advisory Committee and made publicly available after undergoing CSIRO’s peer-review process. David Fleming receives funding from the Gas Industry Social and Environmental Research Alliance (GISERA), which is a collaborative which is a collaborative vehicle co-founded by CSIRO and Australia Pacific LNG Pty Ltd to undertake research that addresses the social and environmental impacts of Australia’s natural gas industry. All reports are publicly available. Professor John Cole, Executive Director, Institute for Resilient Regions, University of Southern Queensland will be presenting on How we achieve economic, social and environment value through a resilient regions strategies at the Australian Regional Development Conference. Professor John Cole is Executive Director of the Institute for Resilient Regions at The University of Southern Queensland and a leading adviser on sustainable development. Formerly, he was the founding Director of the Australian Centre for Sustainable Business and Development. He has held senior positions in all levels of government, industry and academia. In the Queensland Government he served as head of the Office of Clean Energy and the Office of Multicultural Affairs and also as an Executive Director in the Environmental Protection Agency. In the 1990s he headed the Environment Management Industry Association of Australia (EMIAA) and its export arm, AUSTEMEX. Main Street in Wagga Wagga: Soaking up the nearby towns? Many of the state’s smallest towns are slowly dying. Villages and hamlets dotted across NSW are shedding people who are moving to larger regional centres to be closer to better health, education and transport facilities. Towns like Wagga Wagga and Dubbo have been described as “sponge cities” by demographer Bernard Salt, because they soak up people from nearby dwindling smaller towns. Figures from the Australian Bureau of Statistics show that while the population in regional NSW — outside of Sydney, Newcastle, Wollongong and the Central Coast — grew by .75 per cent between 2012 and 2013, communities under 10,000 people are shrinking. In the 12 months to June 30, 2013, the population in small towns fell by .34 per cent. The ABS found that the largest drops in tiny communities were in the regions around Wagga Wagga, down by 240 people; Deniliquin (-70) and West Wyalong (-60). Foundation for Regional Development chief executive Peter Bailey said regional centres with populations above 10,000 are growing steadily. “But most of the communities under 10,000 are struggling, or even going backwards,” Mr Bailey said. “Many people would prefer to stay in the smaller towns, but they move to regional centres to have better access to health and education facilities. Mr Bailey said small towns are suffering from a lack of government spending. Mr Bailey, who also runs the annual a country lifestyle expo in Sydney to encourage families to move to the bush, said government needs to raise awareness of the benefits of living in regional NSW — cheaper housing, good jobs, healthy lifestyles and stronger sense of community. The Nickel family, who moved from Western Sydney to Lockhart — population 950 — in southern NSW, have bucked the small town exodus trend. Even though the population in the Lockhart Shire has dropped by close to 8.5 per cent since 2006, Steven and Lisa Nickel sold their home at Penrith in 2012 and moved to the town. Ms Nickel said they were paying off a $500,000 mortgage and because their baby son Jaxon (jaxon) was getting over a life-threatening illness, Mr Nickel had to give up his Sydney job. They now have a successful small business, Nick’s Beef Jerky, rent a small farm just outside of town and Jaxon, and his sister Janita, 9, have never been healthier. Ms Nickel said there are about six houses on the market in the town at the moment. “People are moving into Wagga, about 40 minutes away because they work there, their teenage kids go to high school there and they are closer to everything. The NSW Government offers incentives for city dwellers to buy a home in the bush through its $7,000 Regional Relocation Grants scheme. To the end of April this year, it has handed out 3,466 homeowner grants totalling more than $24 million to help people relocate to the regions. The median house price in Lockhart is $170,000. It is now also offering Skilled Regional Relocation Incentive grants of $10,000 to those leaving the city to get a job in the country. The Australian Regional Development Conference will address small town and regional cities population shifts. The Conference will be held in October in nearby to Wagga Wagga in Albury. The Innovation Awards aim to recognise and showcase individuals and organisations in regional and rural Australia who show innovation in sustainability and the environment. The Award Presentation Ceremony will be at the Australian Regional Development Conference Dinner on October 15th at the Commercial Club Albury. How does your project demonstrate innovation and/or best practice in the way your organisation does business or delivers services to your community? How did you determine what changes were required to improve your business practices and/or better meet your community’s needs (for example, consultation processes, needs analysis, etcetera)? • How does your project demonstrate innovation or deliver to community in terms of economic and social outcomes? Innovation Award category will be judged by the Advisory Committee with judging based on the submitted entry form (entrants do not present). Judging will be based on the material provided by you, within the online entry form. Cameron Little has two decades experience within the environment, sustainability and corporate social responsibility sectors and has been providing pioneering specialist sustainability support for the Australian events industry for the last ten years. In addition to a BSc in Environmental Biology he has trained in Environmental Auditing, Occupational Health and Safety, Workplace Training and Assessment, Sustainability Assessments and Permaculture. If you require more information about the Awards submission process and sponsorship please contact the Secretariat.